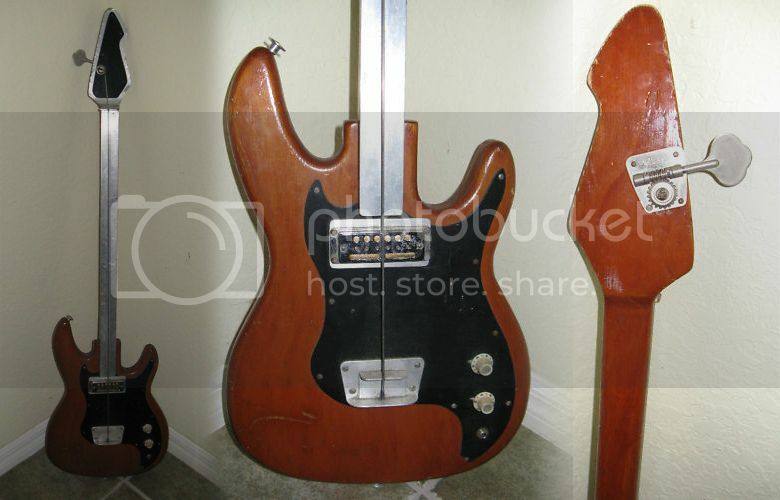 According to the eBay seller, this is "Fender Jaguar inspired" and "a homemade 1 string bass guitar with Fender parts". Well, I can't see any Fender Jaguar influence, nor any genuine or even approximated Fender parts. The pickup looks like it came off an old Teisco or other contemporaneous Japanese 6-string guitar and the headstock shape looks as if its been modelled on a Peavey. Maybe the donor neck is from a Peavey bass? The fretless fingerboard (it's not a "fretboard", as the seller calls it, if it doesn't have any frets!) is made from a piece of aluminium. Thanks to Jeremiah for bringing this auction to my attention. He comments that, with a starting bid of $9.99, at least the price is fair.